20 years today that the Berlin Wall was torn down... East and West Germany were finally united after years of oppression and separation. it's incredible what has happened in history. Like the iron curtain many people found it impossible to believe that communism (at least the eastern block sort) could so suddenly collapse... read some classic escape stories here for evidence of people's desperate plea for freedom. 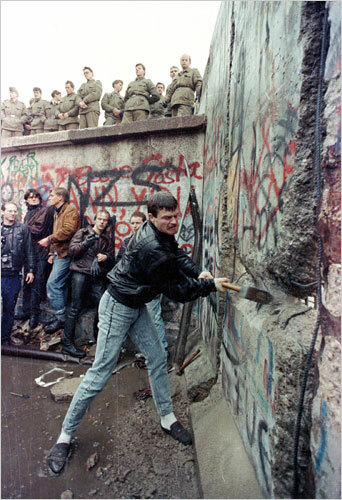 I was privileged to be in East Germany shortly after the wall was removed - it was still very clearly a different world at the time - economics and social segregation had created it's own wall. The same was true in Russia.. again, I spent almost a year there shortly after the fall of communism.. yet the residue of communism existed still - fear, oppression, judgement, etc..
All this leads me to wonder about the residue of the enemy in our lives. We were walled in by fear, death and sin... and Jesus really knocks down that wall and invites us out and Him in... a free world... but I wonder about the marks... the scars... if we are technically free - but afraid to enter the fullness of that freedom. I want all the walls removed. Let's live in a spacious land like God promised... let the only scars remaining be the ones on His body for us. And let wholeness, freedom and peace (shalom) reign in and through us... tear down the wall. I'm praying that a united Germany would be free from the spiritual and social walls of it's past and enter into the fullness of God's spacious and abundant life through Jesus.